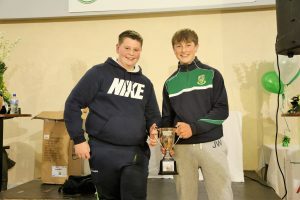 Congratulations to Rory Mc Grath who is the first recipient of the Davy Dennis Cup. The Cup honours the memory of a Cork man who came to work in Newbridge in 1954 and joined Moorefield because the club was “committed to entering hurling teams in the championships” and he perceived Moorefield as having a positive attitude to our traditional field game. 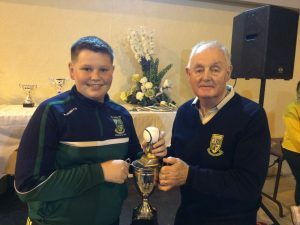 Rory, as a member of the Under-14 team is a player who has displayed dedication, respectfulness, commitment, sportsmanship and all the attributes to make him a worthy winner of this award for 2017. Well done Rory. The inaugural presentation of the Davy Dennis Cup will be made at the underage hurling awards in Moorefield tonight (Friday 10 November). The Cup honours the memory of a Cork man who came to work in Newbridge in 1954 and joined Moorefield because the club was “committed to entering hurling teams in the championships” and he perceived Moorefield as having a positive attitude to our traditional field game. The Cup will be awarded annually at the end of the season. The winner will be chosen from Moorefield hurling players under 18 years of age. The winner will receive a small personal inscribed memento to keep and the Cup must be returned to the club annually.